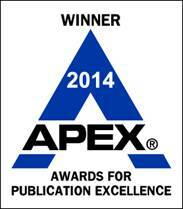 WriteSteps wins APEX 2014 Grand Award for Publishing Excellence in Writing! [Grandville, MI] (PRLOG)-WriteSteps, an evidence-based, 100 percent Common Core K-5 writing and grammar program, has been awarded the APEX 2014 Award of Excellence for Digital Publishing in the writing category. WriteSteps is available both digitally and in print. It includes daily writing lessons for teachers with student visual aids, videos of modeled lessons, print and video updates, and parent resources. Teachers can access the award-winning writing lessons anywhere there is internet access. eWriteSteps, the online teaching portal, works well with interactive white boards, document cameras, and iPads. APEX 2014 — the 26th Annual Awards for Publication Excellence — is an international competition that recognizes outstanding publications from newsletters and magazines to annual reports, brochures and websites. 2,075 entries were evaluated and 100 Awards of Excellence were presented to honor outstanding work in 12 major categories including: newsletters; magazines and journals; megapapers and newspapers; annual reports; brochures, manuals and reports; electronic media; social media; websites; campaigns, programs and plans; writing; design and illustration; and one-of-a-kind publications. WriteSteps was also the recipient of Learning Magazine 2013 Teachers’ Choice Award, the eLit Gold Award for Digital Publishing Excellence, a 2013 APEX Award, a 2014 EdTech Digest Cool Tool Finalist Award, and District Adminstration’s Readers’ Choice Award.